This document describes the "X3DH" (or "Extended Triple Diffie-Hellman") key agreement protocol. X3DH establishes a shared secret key between two parties who mutually authenticate each other based on public keys. X3DH provides forward secrecy and cryptographic deniability. X3DH is designed for asynchronous settings where one user ("Bob") is offline but has published some information to a server. Another user ("Alice") wants to use that information to send encrypted data to Bob, and also establish a shared secret key for future communication. For example, an application could choose curve as X25519, hash as SHA-512, and info as "MyProtocol". An application must additionally define an encoding function Encode(PK) to encode an X25519 or X448 public key PK into a byte sequence. The recommended encoding consists of some single-byte constant to represent the type of curve, followed by little-endian encoding of the u-coordinate as specified in . The concatenation of byte sequences X and Y is X || Y.
DH(PK1, PK2) represents a byte sequence which is the shared secret output from an Elliptic Curve Diffie-Hellman function involving the key pairs represented by public keys PK1 and PK2. The Elliptic Curve Diffie-Hellman function will be either the X25519 or X448 function from , depending on the curve parameter. Sig(PK, M) represents a byte sequence that is an XEdDSA signature on the byte sequence M and verifies with public key PK, and which was created by signing M with PK's corresponding private key. The signing and verification functions for XEdDSA are specified in. HKDF input key material = F || KM, where KM is an input byte sequence containing secret key material, and F is a byte sequence containing 32 0xFF bytes if curve is X25519, and 57 0xFF bytes if curve is X448. F is used for cryptographic domain separation with XEdDSA . HKDF salt = A zero-filled byte sequence with length equal to the hash output length. HKDF info = The info parameter from Section 2.1. The X3DH protocol involves three parties: Alice, Bob, and a server. Alice wants to send Bob some initial data using encryption, and also establish a shared secret key which may be used for bidirectional communication. Bob wants to allow parties like Alice to establish a shared key with him and send encrypted data. However, Bob might be offline when Alice attempts to do this. To enable this, Bob has a relationship with some server. The server can store messages from Alice to Bob which Bob can later retrieve. The server also lets Bob publish some data which the server will provide to parties like Alice. The amount of trust placed in the server is discussed in Section 4.7. In some systems the server role might be divided amongst multiple entities, but for simplicity we assume a single server that provides the above functions for Alice and Bob. All public keys have a corresponding private key, but to simplify description we will focus on the public keys. The public keys used within an X3DH protocol run must either all be in X25519 form, or they must all be in X448 form, depending on the curve parameter . Each party has a long-term identity public key (IKA for Alice, IKB for Bob). Bob also has a signed prekey SPKB, which he will change periodically, and a set of one-time prekeys OPKB, which are each used in a single X3DH protocol run. ("Prekeys" are so named because they are essentially protocol messages which Bob publishes to the server prior to Alice beginning the protocol run). During each protocol run, Alice generates a new ephemeral key pair with public key EKA. After a successful protocol run Alice and Bob will share a 32-byte secret key SK. This key may be used within some post-X3DH secure communication protocol, subject to the security considerations in Section 4. Bob publishes his identity key and prekeys to a server. Alice fetches a "prekey bundle" from the server, and uses it to send an initial message to Bob. Bob receives and processes Alice's initial message. The following sections explain these phases. Bob only needs to upload his identity key to the server once. However, Bob may upload new one-time prekeys at other times (e.g. when the server informs Bob that the server's store of one-time prekeys is getting low). Bob will also upload a new signed prekey and prekey signature at some interval (e.g. once a week, or once a month). The new signed prekey and prekey signature will replace the previous values. After uploading a new signed prekey, Bob may keep the private key corresponding to the previous signed prekey around for some period of time, to handle messages using it that have been delayed in transit. Eventually, Bob should delete this private key for forward secrecy (one-time prekey private keys will be deleted as Bob receives messages using them; see Section 3.4). The server should provide one of Bob's one-time prekeys if one exists, and then delete it. If all of Bob's one-time prekeys on the server have been deleted, the bundle will not contain a one-time prekey. Alice verifies the prekey signature and aborts the protocol if verification fails. 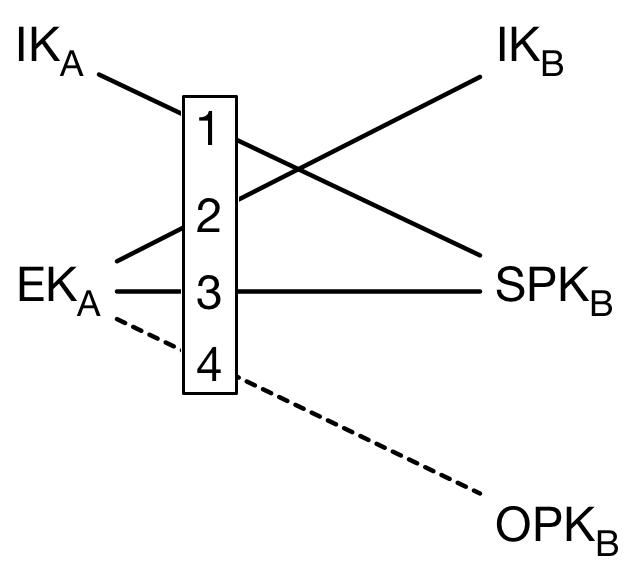 Alice then generates an ephemeral key pair with public key EKA. The following diagram shows the DH calculations between keys. Note that DH1 and DH2 provide mutual authentication, while DH3 and DH4 provide forward secrecy. After calculating SK, Alice deletes her ephemeral private key and the DH outputs. Alice may optionally append additional information to AD, such as Alice and Bob's usernames, certificates, or other identifying information. An initial ciphertext encrypted with some AEAD encryption scheme  using AD as associated data and using an encryption key which is either SK or the output from some cryptographic PRF keyed by SK. The initial ciphertext is typically the first message in some post-X3DH communication protocol. In other words, this ciphertext typically has two roles, serving as the first message within some post-X3DH protocol, and as part of Alice's X3DH initial message. After sending this, Alice may continue using SK or keys derived from SK within the post-X3DH protocol for communication with Bob, subject to the security considerations in Section 4. Upon receiving Alice's initial message, Bob retrieves Alice's identity key and ephemeral key from the message. Bob also loads his identity private key, and the private key(s) corresponding to whichever signed prekey and one-time prekey (if any) Alice used. Using these keys, Bob repeats the DH and KDF calculations from the previous section to derive SK, and then deletes the DH values. Bob then constructs the AD byte sequence using IKA and IKB, as described in the previous section. Finally, Bob attempts to decrypt the initial ciphertext using SK and AD. If the initial ciphertext fails to decrypt, then Bob aborts the protocol and deletes SK. If the initial ciphertext decrypts successfully the protocol is complete for Bob. Bob deletes any one-time prekey private key that was used, for forward secrecy. Bob may then continue using SK or keys derived from SK within the post-X3DH protocol for communication with Alice, subject to the security considerations in Section 4. Before or after an X3DH key agreement, the parties may compare their identity public keys IKA and IKB through some authenticated channel. For example, they may compare public key fingerprints manually, or by scanning a QR code. Methods for doing this are outside the scope of this document. If authentication is not performed, the parties receive no cryptographic guarantee as to who they are communicating with. If Alice's initial message doesn't use a one-time prekey, it may be replayed to Bob and he will accept it. This could cause Bob to think Alice had sent him the same message (or messages) repeatedly. To mitigate this, a post-X3DH protocol may wish to quickly negotiate a new encryption key for Alice based on fresh random input from Bob. This is the typical behavior of Diffie-Hellman based ratcheting protocols . Bob could attempt other mitigations, such as maintaining a blacklist of observed messages, or replacing old signed prekeys more rapidly. Analyzing these mitigations is beyond the scope of this document. Another consequence of the replays discussed in the previous section is that a successfully replayed initial message would cause Bob to derive the same SK in different protocol runs. For this reason, any post-X3DH protocol MUST randomize the encryption key before Bob sends encrypted data. For example, Bob could use a DH-based ratcheting protocol to combine SK with a freshly generated DH output to get a randomized encryption key . Failure to randomize Bob's encryption key may cause catastrophic key reuse. X3DH doesn't give either Alice or Bob a publishable cryptographic proof of the contents of their communication or the fact that they communicated. Like in the OTR protocol , in some cases a third party that has compromised legitimate private keys from Alice or Bob could be provided a communication transcript that appears to be between Alice and Bob and that can only have been created by some other party that also has access to legitimate private keys from Alice or Bob (i.e. Alice or Bob themselves, or someone else who has compromised their private keys). If either party is collaborating with a third party during protocol execution, they will be able to provide proof of their communication to such a third party. This limitation on "online" deniability appears to be intrinsic to the asynchronous setting . It might be tempting to observe that mutual authentication and forward secrecy are achieved by the DH calculations, and omit the prekey signature. However, this would allow a "weak forward secrecy" attack: A malicious server could provide Alice a prekey bundle with forged prekeys, and later compromise Bob's IKB to calculate SK. Alternatively, it might be tempting to replace the DH-based mutual authentication (i.e. DH1 and DH2) with signatures from the identity keys. However, this reduces deniability, increases the size of initial messages, and increases the damage done if ephemeral or prekey private keys are compromised, or if the signature scheme is broken. Compromise of a party's private keys has a disastrous effect on security, though the use of ephemeral keys and prekeys provides some mitigation. Compromise of a party's identity private key allows impersonation of that party to others. Compromise of a party's prekey private keys may affect the security of older or newer SK values, depending on many considerations. If one-time prekeys are used for a protocol run then a compromise of Bob's identity key and prekey private keys at some future time will not compromise the older SK, assuming the private key for OPKB was deleted. If one-time prekeys were not used for a protocol run, then a compromise of the private keys for IKB and SPKB from that protocol run would compromise the SK that was calculated earlier. Frequent replacement of signed prekeys mitigates this, as does using a post-X3DH ratcheting protocol which rapidly replaces SK with new keys to provide fresh forward secrecy . Compromise of prekey private keys may enable attacks that extend into the future, such as passive calculation of SK values, and impersonation of arbitrary other parties to the compromised party ("key-compromise impersonation"). These attacks are possible until the compromised party replaces his compromised prekeys on the server (in the case of passive attack); or deletes his compromised signed prekey's private key (in the case of key-compromise impersonation). A malicious server could cause communication between Alice and Bob to fail (e.g. by refusing to deliver messages). If Alice and Bob authenticate each other as in Section 4.1, then the only additional attack available to the server is to refuse to hand out one-time prekeys, causing forward secrecy for SK to depend on the signed prekey's lifetime (as analyzed in the previous section). This reduction in initial forward secrecy could also happen if one party maliciously drains another party's one-time prekeys, so the server should attempt to prevent this, e.g. with rate limits on fetching prekey bundles. Authentication as in Section 4.1 does not necessarily prevent an "identity misbinding" or "unknown key share" attack. This results when an attacker ("Charlie") falsely presents Bob's identity key fingerprint to Alice as his (Charlie's) own, and then either forwards Alice's initial message to Bob, or falsely presents Bob's contact information as his own. The effect of this is that Alice thinks she is sending an initial message to Charlie when she is actually sending it to Bob. To make this more difficult the parties can include more identifying information into AD, or hash more identifying information into the fingerprint, such as usernames, phone numbers, real names, or other identifying information. Charlie would be forced to lie about these additional values, which might be difficult. However, there is no way to reliably prevent Charlie from lying about additional values, and including more identity information into the protocol often brings trade-offs in terms of privacy, flexibility, and user interface. A detailed analysis of these trade-offs is beyond the scope of this document. The X3DH protocol was developed by Moxie Marlinspike and Trevor Perrin. The underlying "Triple DH" key agreement was proposed by Caroline Kudla and Kenny Paterson in , extending the earlier "Double DH" (aka "Protocol 4") key agreement from Simon Blake-Wilson et al . Using signatures in combination with implicitly-authenticated key agreement has been discussed in works like  and . Thanks to Mike Hamburg for discussions about identity binding and elliptic curve public keys. Thanks to Nik Unger and Matthew Green for discussions about deniability. Thanks to Matthew Green, Tom Ritter, Joseph Bonneau, and Benedikt Schmidt for editorial feedback. T. Perrin, “The Double Ratchet Algorithm (work in progress),” 2016.